Tottenham v Dortmund was billed as a 50/50 game, which in fairness it was for large parts of the game. But a fantastic goal by Heung-min Son and two late goals by Jan Vertonghen and Fernando Llorente ultimately settled the game, and perhaps, the tie for Tottenham. The first 15 minutes would be crucial for Dortmund experts ahead of the game suggested. Tottenham certainly pressed high up the press, and Lucas Moura should have taken the lead in the 8′ minute, but his shot from just outside the penalty box just about missed the far post. Dortmund struggled to get the ball out of their end, and it took the Black and Yellows until the 15′ minute to create a chance. Mario Götze had won the ball at the edge of the box passed the ball to Christian Pulisic, the US American went deep into the box, where he could have laid the ball off to Jadon Sancho but instead opted to shoot himself and was easily blocked. That chance, however, gave Dortmund some confidence. The Black and Yellows had overcome Tottenham’s high press, and patchwork defence put together ahead of the match now dealt well with the Spur’s attacking line. When Tottenham did get through then, goalkeeper Roman Bürki was ready, like it was the case in the 36′ when the keeper stopped a low drive by Heung-min Son. On the other side, Dan-Axel Zagadou almost got the lead just before halftime. Lloris had to pull out a fantastic save following a thunderous header by the Dortmund defender in the 45′ minute after a fantastic cross by Jadon Sancho. Watching the two teams in the first half was fascinating. 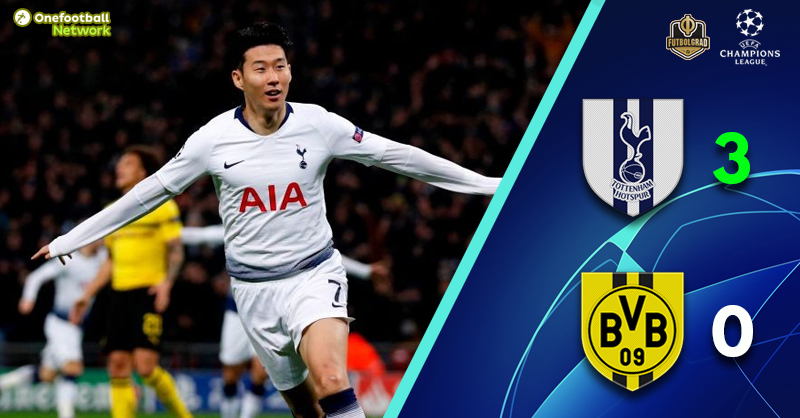 Tottenham pressed high, making it difficult for Dortmund to play out of their own half but whenever the Black and Yellows did find a way they right away created a chance and overall they seemed like the more dangerous of the two teams. Nonetheless, it was Tottenham that would take the lead. Once again it was Heung-min So, who would terrorise Dortmund. Vertonghen won the ball deep in Dortmund’s half, and the wing-back played a perfect cross into the centre of the box where Son dropkicked the ball past Bürki in the 47′ minute. How would Dortmund react? Dortmund now pressed further up the pitch, which, in turn, gave Tottenham the necessary room to play dangerous counter-attacks. In fact, Tottenham were the more dangerous side going forward time and time finding space behind Dortmund’s backline without, however, producing another tangible chance. It was almost a deadlock after the first goal for most of the second half. But in the 83′ minute, Tottenham doubled the lead. Serge Aurier won the ball in the half-field and played a fantastic cross into the box where Vertonghen had escaped the defence and dropkicked a ball past Bürki to make it 2-0. Just moments later it was game over for Dortmund. Fernando Llorente brought on just moments earlier, got on the end of a Christian Eriksen corner and made it 3-0 in the 84′ minute. Like last season Tottenham were too efficient for a Dortmund side that lacked speed and could not compensate for the absence of Marco Reus. Jan Vertonghen was the man of the match. Nominally, a centre-back Mauricio Pochettino utilised the defender in the wing-back position in a 3-4-1-2 formation. Vertonghen assisted the first goal with a fantastic cross and then produced a great goal to make it 2-0, which may have opened the road to the quarterfinals. Borussia Dortmund have now dropped four points in the Bundesliga, have gone out in the DFB Pokal to Werder and are out of the Champions League as well. The game against Nürnberg on Monday is now a crucial game for Dortmund. Furthermore, Lucien Favre has to come up with a concept to replace Marco Reus, Christian Pulisic at the moment seems unable to fill that void.